Welcome to Buckingham's Retinue, one of the more authentic medieval re-enactment groups for the period 1450-1500. Our society is a non profit orgainsation that exists to reconstruct and re-enact late medieval and early tudor life, recreating the period known as 'The Wars of the Roses'. If you are interested in taking up tudor or medieval re-enactment as a hobby, check out our Recruitment section to see the kinds of things we do and how you can take part. If you want to see us in action, here is Buckingham's Retinues Events List for 2019. If you own or manage a historical site and want to know how Buckingham's Retinue could bring it to life, please read our Employers' section. We also have a wide variety of information about medieval life, from histories of the wars of the roses, guides on clothing, songs, weaponry information, as well as a history of the Stafford Family, who were the first Dukes of Buckingham. Buckingham’s Retinue have a fantastic programme of medieval events across the country for 2019. In July we will be in North Yorkshire bringing Skipton Castle to life, with servants cooking in the castle kitchens, nobles feasting in the great hall, and soldiers practicing archery and combat on the lawn. With displays, talks and activities throughout the day in such a beautiful setting, re-enactments do not get much better that this! August sees Buckingham’s Retinue return to one of the National Trust’s most picturesque properties, the red brick, moated Oxburgh Hall in Norfolk. We have a family focused programme with lots of child friendly activities planned, including medieval arts and crafts where youngsters can practice their scribing technique, knight school for young warriors, and medieval dancing for everyone to participate in. We have two events this year as part of Livery and Maintenance, where we will be exploring the truth behind “Medieval Myths and Legends” for English Heritage. 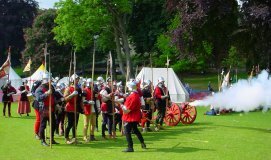 The first event is at Bolsover Castle in Derbyshire over the first May bank holiday weekend, with the second event at Scarborough Castle in North Yorkshire over the August bank holiday weekend. Visitors can expect a large living history camp with lots of crafts on display, combat demonstrations, music, dance and of course a wonderful castle to explore. We are also participating in the largest medieval battle re-enactments of the year at Tatton Park (June), Tewkesbury (July) and Bosworth (August). As well as large scale battles, these events boast large historic markets catering for re-enactors and the public, where you can purchase practically anything medieval in design to hang of your wall or wear on the battlefield. Finally, in October Buckingham’s Retinue will be bringing a different style of medieval event to the Manor House in Sandwell (Birmingham). Final details are being arranged but the weekend will involve bringing the interior of the Manor House to life, with a selection of crafts and activities for all the family to get involved in. We very much look forward to seeing as many people as possible at this year’s events – please do come along as a spectator, or if you fancy participating then get in touch and we would be delighted to get you involved!